(PhysOrg.com) -- Analysis of data from MESSENGER's third and final flyby of Mercury in September 2009 has revealed evidence of younger volcanism on the innermost planet than previously recognized, new information about magnetic substorms, and the first observations of emission from an ionized species in Mercury's very thin atmosphere or exosphere. The results are reported in three papers published online on July 15 in the Science Express section of the website of Science magazine. "Every time we've encountered Mercury, we've discovered new phenomena," says MESSENGER principal investigator Sean Solomon, of Carnegie's Department of Terrestrial Magnetism. "We're learning that Mercury is an extremely dynamic planet, and it has been so throughout its history. Once MESSENGER has been safely inserted into orbit about Mercury next March, we'll be in for a terrific show." During its first two flybys of Mercury, MESSENGER captured images confirming that pervasive volcanism occurred early in the planet's history. The spacecraft's third Mercury flyby revealed a 290-kilometer-diameter peak‐ring impact basin, among the youngest basins yet seen and recently named Rachmaninoff, having an inner floor filled with spectrally distinct smooth plains. The sparsely cratered Rachmaninoff plains postdate the formation of the basin and apparently formed from material that once flowed across the surface. "We interpret these plains to be the youngest volcanic deposits yet found on Mercury," says lead author Louise Prockter, of The Johns Hopkins University Applied Physics Laboratory, in Laurel, Md., and one of MESSENGER's deputy project scientists. 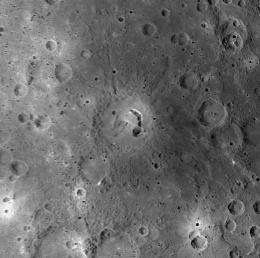 "Moreover, an irregular depression surrounded by a diffuse halo of bright material northeast of the basin marks a candidate explosive volcanic vent larger than any previously identified on Mercury. These observations suggest that volcanism on the planet spanned a much greater duration than previously thought, perhaps extending well into the second half of solar system history." Magnetic substorms are space-weather disturbances that occur intermittently on Earth, usually several times per day, and last from one to three hours. Terrestrial substorms are accompanied by a range of phenomena, such as the majestic auroral displays seen in the Arctic and Antarctic skies. Substorms are also associated with hazardous energetic particle events that can play havoc with communications and Earth-observing satellites, particularly at the altitudes of geosynchronous orbits. Terrestrial magnetic substorms are powered by magnetic energy stored in Earth's magnetic tail. During MESSENGER's third Mercury flyby, the Magnetometer documented for the first time the substorm-like build-up, or "loading," of magnetic energy in Mercury's magnetic tail. The increases in energy that MESSENGER measured in Mercury's magnetic tail were very large, by factors of two to three, and they occurred very quickly, lasting only two to three minutes from beginning to end. These increases in tail magnetic energy at Mercury are about 10 times greater than at Earth, and the substorm-like events run their course about 50 times more rapidly. "The extreme tail loading and unloading observed at Mercury implies that the relative intensity of substorms must be much larger than at Earth," says lead author James A. Slavin, a space physicist at NASA's Goddard Space Flight Center and a member of MESSENGER's Science Team. "However, what is even more exciting is the correspondence between the duration of tail field enhancements and the Dungey cycle time, which describes plasma circulation through a magnetosphere. "With these new MESSENGER measurements we can show for the first time that the Dungey plasma circulation time determines substorm duration at another planet and not just at Earth, suggesting that this relation may be a universal feature of terrestrial-type magnetospheres, Slavin says. "A key aspect of tail unloading during terrestrial substorms is the acceleration of energetic charged particles, but no acceleration signatures were seen during the MESSENGER flyby. It appears that this new mystery will not be solved until more extensive measurements are made when MESSENGER is in orbit about Mercury." Mercury's exosphere is a tenuous atmosphere of atoms and ions derived from the planet's surface and from the solar wind. Observations of the exosphere provide a window into the extensive interactions between Mercury's surface and its space environment. The insights such observations provide into surface composition, transport of material about the planet, and loss of material to interplanetary space improve our understanding not only of the current state of Mercury but also of its evolution. 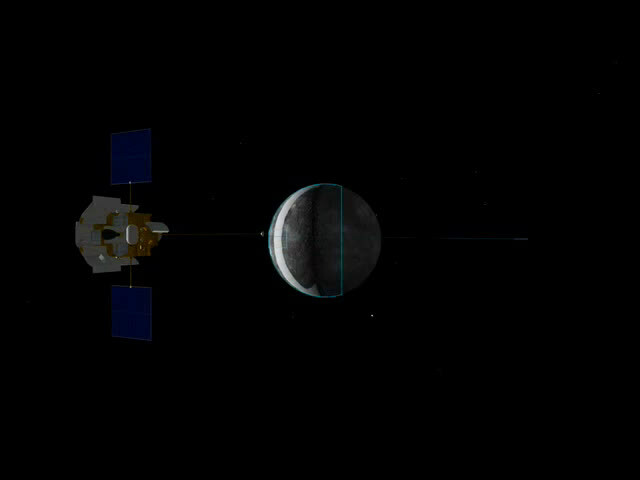 Watch an animation of the spacecraft maneuvers and the instrument observations that were planned for MESSENGER's third flyby of Mercury. The spacecraft's observations of Mercury's exosphere indicate remarkably different spatial distributions among the neutral and ionized elements in the exosphere. The third flyby produced the first detailed altitude profiles of exospheric species over the north and south poles of the planet. "These profiles showed considerable variability among the sodium, calcium, and magnesium distributions, indicating that several processes are at work and that a given process may affect each element quite differently," says MESSENGER participating scientist and lead author Ron Vervack, also at the Applied Physics Laboratory. Differences in the distributions of sodium, calcium, and magnesium were also observed anti-sunward of the planet. "A striking feature in the near-planet tail ward region is the emission from neutral calcium atoms, which exhibits an equatorial peak in the dawn direction that has been consistent in both location and intensity through all three flybys," Vervack says. "The exosphere of Mercury is highly variable owing to Mercury's eccentric orbit and the effects of a constantly changing space environment. That this observed calcium distribution has remained relatively unchanged is a complete surprise." Prominent among the discoveries during the third flyby were the first observations of emission from ionized calcium in Mercury's exosphere. "The emission was concentrated over a relatively small area one to two Mercury radii anti-sunward of the planet with most of the emission occurring close to the equatorial plane," says Vervack. "This concentrated distribution cannot be explained by in situ conversion of local calcium atoms to calcium ions and instead points to magnetospheric transport of the ions as a mechanism for concentrating them as observed. Although such transport is common in planetary magnetospheres, the degree to which it can affect the distribution of species in Mercury's exosphere was not fully appreciated."